My first experience with Real Estate live was as an opening band for Love Is All at Music Hall a mere nine months ago. Last night at the same venue, there was one obvious fact — they have gotten a lot better. In October at Market Hotel, we remarked about their improvement, but last night was another world entirely. The band has coalesced into a tight unit, performing their songs with the same energy but with a clear focus and, dare I say it, professionalism. The guitars were all in tune, the solos were well placed and purposeful and the rhythm section was precise. Coupled with the well-mixed excellent sound system of Music Hall, the bottom line is that last night Real Estate sounded just plain terrific. While they were the third of four bands on the bill for this sold out show, it was also clear that many in the crowd were there to see Real Estate. 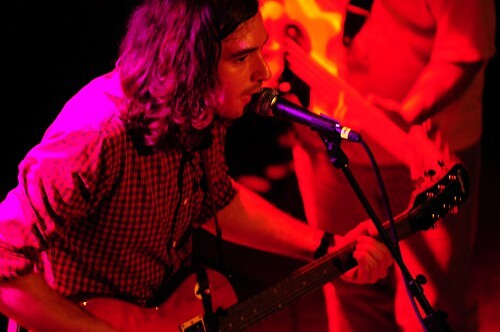 The band worked through a setlist consisting primarily of their debut album material, but of note was the new opening song performed only for the second time, and the dead-on cover of Ariel Pink’s “My Molly“. Last night was the first night of the combined Real Estate and Woods tour. The tour travels through the midwest before SXSW and then continues down south to the end of March. In May, Real Estate tours Europe. Find all the tour dates at their MySpace page. I recorded this set with the four microphone rig at the usual location directly in front of the soundboard. The sound in this venue continues to excel and this entire show was mixed particularly well. As a result the sound quality of this recording is superb. Enjoy! Woods was also recorded and will be posted tomorrow. 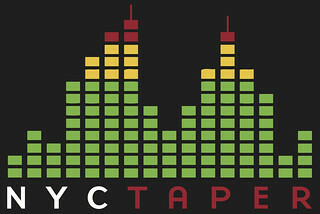 f you email nyctaper for access to this recording, we expect that you will PLEASE SUPPORT Real Estate, visit their MySpace page, and purchase their releases from Woodist Records, Half Machine Records, and Underwater Peoples (currently sold out). awesome show. thanks so much for taping! Why don’t you tag these? Adding them all in iTunes is so frustrating. where’d the video go dude?